You Save: $5.00 (20%) Ships in 1 day. Hard Cover, 300 pages, 6.75 x 9.75. There really is a Pete. He's the hottest, most recognized celebrity in America's beer industry. 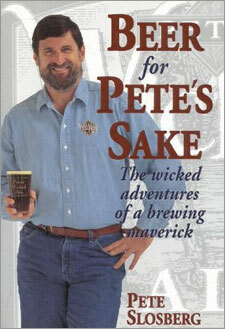 A true defender of the brew, Pete Slosberg has given a face to the craftbrewing movement. He's the Ben and Jerry of beer—that is, doing what he loves and succeeding at it. He has been called a brewing maverick, a brilliant entrepreneur, an iconoclast, and a marketing icon—but who is Pete Slosberg really? What happened on the way from his first homebrewed beer in his kitchen to the Inc. 500 company he founded? Pete tells all. So if you want to know what Quentin Tarantino, Millie the English Bull Terrier, Spuds MacKenzie, Bart Simpson, Governor Pete Wilson, the Top Gun crew, and a successful business man all have in common . . . Grab this book . . . put your feet up, and enjoy learning about the business of beer and an American success named PETE!!! Pete Slosberg lives with his family in Los Altos Hills, California.